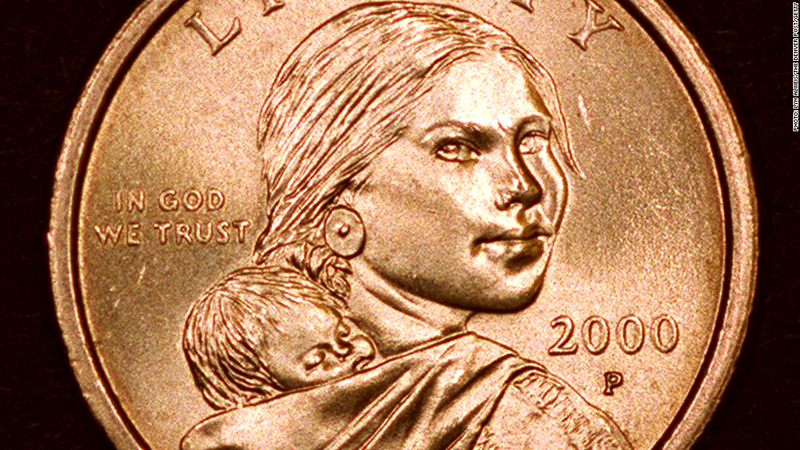 The Sacagawea Golden Dollar was put into circulation in 2000 but never caught on in a big way. People who want to replace the flimsy dollar bill with a sturdier metal coin are pushing their cause again. The switch, which has been discussed for years, could save taxpayers $13.8 billion over 30 years, according to a report released this week by Aaron Klein, a former deputy assistant secretary of Treasury. On the one hand, it costs only 5 cents to produce a $1 bill and 18 cents to produce a $1 coin, the report states. But the lifespan of a $1 bill is much shorter -- 4.8 years compared to 30 years. Klein prepared the report for the Dollar Coin Alliance, a group of small businesses, mass transit agencies and others who support transitioning to the one dollar coin. Bill Christian, director of government affairs for Council for Citizens Against Government Waste, said the report is just the latest evidence that it's time to make the switch. "Once again, the result is clear: eliminate the $1 bill and save billions." The nonpartisan Government Accountability Office has said that replacing the $1 bill with a $1 coin would save hundreds of millions of dollars annually. The United States is one of the few western nations still using paper dollars. "Over the last 48 years, Australia, Canada, France, Japan, the Netherlands, New Zealand, Norway, Russia, Spain, and the United Kingdom, among others, have replaced lower-denomination notes with coins," according to the GAO report. Last month, a bipartisan group of senators including Democrats Tom Harkin and Mark Udall and Republicans John McCain and Tom Coburn reintroduced the Currency Optimization, Innovation, and National Savings Act -- or COINS Act. The bill aims to "improve the circulation of $1 coins, to remove barrier to the circulation of such coins, and for other purposes." "With our nation's debt now standing at $16.8 trillion, Congress must look at every area of the federal government, big or small, to save money," McCain said this week. "And this simple bipartisan bill will do just that -- save money." The idea of moving away from dollar bills is not new, but dollar coins have not gained wide public acceptance apart from collectors. The Susan B. Anthony dollar, introduced in 1979, was discontinued in 1999 although some remain in circulation. The Sacagawea Golden Dollar was put into circulation in 2000 but never caught on in a big way. One of the main complaints about dollar coins is they are heavy and cumbersome. The conversion would also add costs, the GAO report noted. Cash-intensive businesses would have to modify vending machines, cash register drawers and night depository equipment to accept $1 coins. Over the longer term, some businesses would have to buy coin counting and coin wrapping machines. Others would bear higher transportation and storage costs because of the heavier and bulkier coins. The lack of public acceptance of the $1 coin is in part because the $1 bill remains in circulation, according to the GAO. Canada and Britain found that once paper notes were taken out of circulation, public resistance dissipated within a few years.